Of course, the definition of a “Pixar moment” extends to any medium of art, from painting to music to literature, because it doesn’t need to be specific to this studio’s filmography. But for the sake of this discussion, we’ll limit ourselves to what Pixar has done in the past 18 years. So what is a “Pixar moment”? A scene, sequence, or shot of pure transcendence, beauty that requires countless elements to fall into place just so for the entire thing to work as well as it does. Where the “Pixar moment” moniker applies is that every one of their films—yes, even Cars 2—has such a moment. Not every filmmaker or studio is talented or, sometimes, lucky enough to create a moment of such unspeakable brilliance, but Pixar is both. And although they’ve been producing such awe-inspiring moments since 1995, today, we’ll look at their very best, Ratatouille. 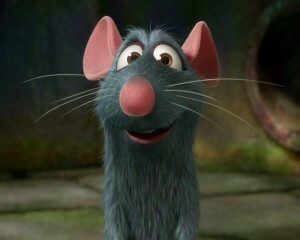 The buildup, you know: Remy is a rat living in France who longs to be a chef like his idol, the late Auguste Gusteau. After he’s separated from his less high-minded family, Remy winds up in the middle of Gusteau’s, helping the restaurant come back from its three-star status by cooking under the toque of a well-meaning goofball who turns out to be Gusteau’s son, Alfredo Linguine. The restaurant regains its popularity so quickly that it draws the attraction and ire of feared critic Anton Ego, whose previous review was so nasty, Gusteau’s lost its five-star rating, beginning its downward spiral into mediocrity. Ego expects more than the best, and after a series of complications, Remy is able to deliver with the titular dish. The stunning, silent, revelatory visualization of the food’s taste—Remy has made something so good it brings Ego back to his childhood, the very definition of comfort food—is poignant, moving, and wholly unexpected. Even more so is Ego’s review, a reflective moment not only of Remy’s work, but of the art and craft of criticism. Ratatouille is, on the whole, an exceptionally profound film, one that may feel excessively so because it comes from a major corporation not known for such intelligent, uncommonly inward character studies, especially none that are animated. Upon the film’s initial release, this scene, specifically Ego’s review, felt especially striking if only because its poetic words weren’t any more dumbed down than what came before it. So many so-called “family films” talk down to children, presuming a widespread lack of brains among youth, but the majority of Pixar’s films sidestep this and treat every audience member equally. Such generous humanity extends to Brad Bird’s script and direction, allowing Anton Ego more dimension than you might expect. It is rare, these days, for artists to engage with critics on equal footing. Either you demonize the person who dares to tell you whatever you’ve worked on for years isn’t pristine and flawless, or you smugly claim ignorance to what the would-be Pauline Kaels of the world are saying about your work, which in itself is the antithesis of ignorance. Critics are often vilified, pariahs treated like second-class citizens, and admittedly, when we first meet Anton Ego, literally looking down upon the world in a coffin-sized office, it looks like Bird will fall prey to this clichéd temptation. That he doesn’t is one of this scene’s purest strokes of genius. Ego’s name, his stentorian voice (provided magnificently by the great Peter O’Toole), and his tall, crouched, reed-thin body all are meant to posit Ego as the villain of the piece. It is Ego’s denial of Gusteau’s adage “Anyone can cook” that inspired him to trash the restaurant, sending Gusteau into a tailspin that lead to his death. It is Ego’s fury that the restaurant has gotten a second wind that makes him re-review Gusteau’s, likely with the knives out. And everyone else—rats and humans—is terrified of Ego, he of the slicked-back hair, dark clothing, and nihilistic aura. He is the textbook case of a stereotypical critic, standing in an almost-literal ivory tower, glass of Pinot Noir in hand, ready to destroy with a verbal parry or thrust. He could even typify the Pixar view of the critic, someone who once lifted up their work but swooped down upon them when they dared make a mistake, even a Cars-shaped one. What we come to celebrate today is not that Anton Ego is won over by Remy, that most impossible of goals, but how the payoff is executed. We know Ego will give Remy a good review; how else can our friend the rat triumph if not by proving that anyone can cook to the one man in this world who doubts it with all his heart? The manner in which this is pulled off, the way Ego realizes exactly what the phrase “Anyone can cook” truly means is beautifully staged. Here, as in many other parts of Ratatouille, Bird takes to heart the oldest possible criticism of creative writing: show, don’t tell. We don’t need Ego to verbalize what it is about Remy’s ratatouille dish that touches him so, nor do we need him to say one word about the flashback to his childhood. The animation, Michael Giacchino’s score crescendoing as the dish is presented to Ego for perusal and hopeful praise, the editing, and the cinematography combine for a truly thrilling experience, all the more exciting because it’s centered around a man eating a plate of food and then writing about it. Maybe I’m just a sucker for a decent appreciation of criticism in the 21st century, and in such a mainstream fashion. But that’s only because there’s never been a more fractious period in which to proffer critiques about anything. Whatever you write, someone will visit you in the adjoining comments section to tell you that your opinion is invalid because you’re secretly jealous of filmmakers because you’ve tried to make movies of your own and failed, or because you just don’t have the creative drive. Or maybe you’re wrong because critics are always negative, and what you need to do is cheerlead for what that commenter likes. The wise among you are now saying, “This is why you should avoid comments sections,” and while that’s accurate, the groundswell of opinion has become so powerful, it’s hard to ignore entirely, to the point where you act defensive in even the most commonplace critique. 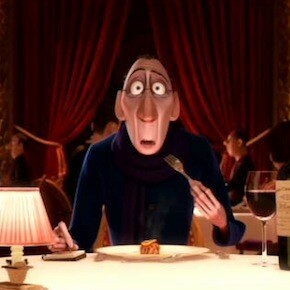 So returning to Ratatouille after a long time away conjures, in itself, the same feeling Anton Ego gets when he takes that first bite. Brad Bird—obviously one of many people who worked on this film, and not the person who conceived of a rat aspiring to create haute cuisine, but called out here because Ratatouille has the unmistakable stamp of an auteur—is able to thread the complex needle of painting a portrait of the artist and the art lover without compromising. Anton Ego’s evolution from a one-dimensional scarecrow-like scribe to a man willing to embrace the world is much like Remy’s evolution, as they both move closer to acceptance. Early on in Ratatouille, Remy dismisses the idea that Linguine, a doofus through and through, could ever cook, saying “Anyone can cook, but not anyone should.” Remy is forced to challenge that idea, not just with Linguine, but with his love interest, Colette, who treats it as a point of pride that she’s gotten so far in the culinary world despite not being a man. Each of these characters embraces, as Ego says in his review, “the discovery and defense of the new.” Their preconceived notions are challenged and reversed, in terrific fashion. Ego’s review is the capper to the entire film, not because we didn’t already know (as much as a movie audience can) that Remy was a truly great chef, but because he needs that quality validated. He needs to know that the harshest critic can be won over, that critics may have fun writing negative criticism but that they can admire and champion goodness when it’s placed in front of them. This is, in many respects, the true power of the critic, one that often goes unspoken among artists who lash out against them: creators depend on critics. That dependence doesn’t always manifest as a reason to change—Kevin Smith’s output in the last few years has relied heavily on critics, more as a way to reclaim whatever independence he has than to mature in his filmmaking so he can strike down the most common critiques of his work. But the artist needs the critic so his or her work isn’t sent straight into a vacuum. Ego’s review, as much a treatise on why we need well-reasoned, thoughtful, honest criticism as it is about Remy’s meal, is an ode to one-half of the artistic process, a paean to the pointed opinion. Ratatouille remains Pixar’s finest artistic treasure, though it was the first of four consecutive films that could lay claim to such a title. It’s a perceptive, wise, and clever look at the struggles of the creative process, a full-length explanation of how difficult it is to make art and get that art to be accepted by the few or the many. What makes the climactic “Pixar moment” so memorable, as potent now as it was six years ago, is the film’s willingness to allow its entire ensemble even a soupçon of grace. Too many movies demonize the media; this isn’t to say that the press, or that all critics, are saints. But there are some easy clichés in film: lawyers are sleazy, cops are corrupt, and the press is full of careless egotists. Anton Ego, despite his last name, is as three-dimensional and human as Linguine, Colette, and Remy. Ego’s attitude and outlook change in that dramatic, exciting shot when he first eats what Remy prepared for him, as the camera zooms into his wide-open eyes and back into his youth, as his mother tends to him with food and with love. It is with love, as well as respect, that Brad Bird and Ratatouille treats the art of criticism and its practitioner, the same as with the artist and his craft. Here, more than in any other of their films, we have the quintessential, powerful Pixar moment. Josh isn't just a Disney buff, a film buff, or a TV buff. He's a pop-culture obsessive, through and through. His long journey began in Western New York and has taken him to the American Southwest, where he resides with his wife and six--count 'em, six--cats. Among his favorite overall films are Singin' In The Rain, There Will Be Blood, A Matter of Life and Death, and The Royal Tenenbaums. His favorite Disney movie (non-Pixar) is Beauty and the Beast, but his favorite Pixar movie is Ratatouille, and he thinks the latter is at least five times better than the former. Read more of Josh's work at Movie Mezzanine.